Abramelin Oil is a famous formula for ritual oil whose name came about due to its having been described in a medieval grimoire called "The Book of the Sacred Magic of Abramelin the Mage" written by Abraham of Worms, a fifteenth century Jewish Kabbalist. The recipe is adapted from the Jewish Holy Oil of the Tanakh, which is described in the Book of Exodus attributed to Moses. When adapted into the form of a sachet powder, it is used to draw designs on the altar and to free-standing candles that have been rubbed with Abramelin Oil. 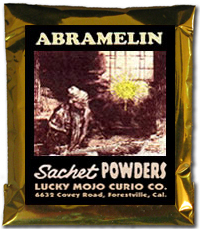 The sachet may also be used to powder talismans made according to any of the Jewish or kabbalistic methods, including Solomonic, Mosaic, and numerological talismans.